Rupert Pupkin Speaks: Favorite Underrated Horror: Austin Vashaw ""
Austin is a seasoned technology and multimedia professional in Overland Park, KS (a suburb of the Kansas City area), but his passion is film. He has a Twitter profile where I frequently talk movies, and a Letterboxd account where he logs, reviews, and discusses films in greater depth. This may seem a weird one to start with - after all, RINGU enjoys highly favorable critical and commercial acclaim. But the legacy of RINGU is precisely what makes it so easy to overlook. In the West, it stands in the shadow cast by Gore Verbinski's competent but lesser remake, THE RING. In the East, it contends not only with a handful of inferior sequels, but also countless copycat films featuring ghoulish long-haired girls and haunted gadgets. With so many derivatives, we've perhaps collectively forgotten what made the original so special: it's a highly unnerving film with disturbing imagery, great performances (including a breakout role for Hiroyuki Sanada, who has since become one of Japan's most exciting international stars), and the absolutely ingenious trick of turning your TV an object of utter terror that lingers after the film is done - especially in those bygone days when tube TVs glowed menacingly for several minutes after being turned off. Every horror fan knows Tobe Hooper, the director of THE TEXAS CHAIN SAW MASSACRE, SALEM'S LOT, and POLTERGEIST. Lately another of his films, LIFEFORCE, has also been experiencing something of a popular revival. But what horror fans may not know is that Hooper boasts a pretty sizable filmography of horror flicks besides his big hits. 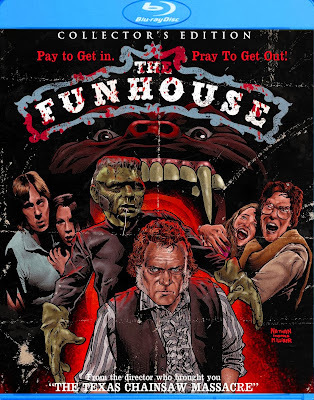 THE FUNHOUSE is one of these, a creepy chiller that revels in the frightening nature of clowns, carnies, and circus freaks. For four teens, a promiscuous night spent hiding in a circus funhouse takes a deadly turn when they witness some bizarre things they weren't meant to see. Bad for them, good for the audience. 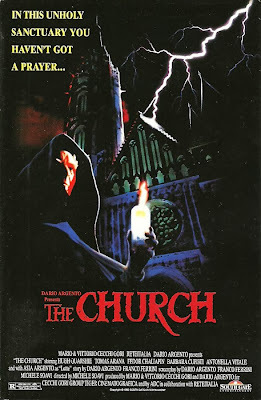 Originally conceived as DEMONS 3, Michele Soavi's THE CHURCH is a weird and memorable Italian shocker. 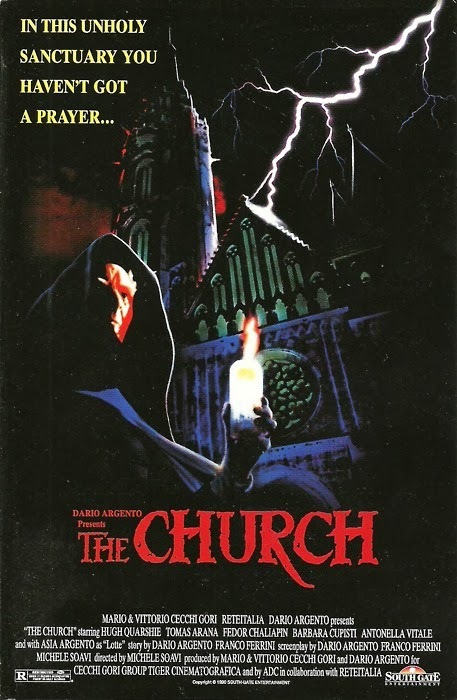 It takes place in an old Gothic cathedral which is built over a cursed Medieval burial ground. Flashing forward to modern times, demonic forces manage to take root in the church's basement and then begin to attack the people in the building. The church is elaborately designed with hidden machinery to seal itself off if the entombed evil should ever escape, and the scene in which it does so is a mesmerizing and technically impressive whirlwind of wooden gears and old-world mechanisms that transform the building into an eerie fortress. Once that happens, it's up to a priest and young girl to survive and fight the increasingly powerful demonic influence. Another unexpected entry for a list like this, but right now I'm not thinking about you. I'm thinking about your kids. 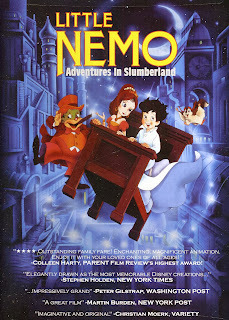 LITTLE NEMO is a glorious anime film based on the beloved classic Winsor McCay comics. It's highly imaginative and beautifully animated, but it's also pretty freakin' scary at times. The flipside to the whole "dream world" motif is that there's also a world of nightmares. In one harrowing dream sequence we see Nemo call out to his mother to warn her of impending danger -- but she's facing the other way and is deaf to his cries, and won't turn her head. This is eerily accurate as the sort of nightmare that kids really have. Eventually Nemo is transported to the happy world of Slumberland, where he befriends kindly King Morpheus and several other characters. But he breaks the cardinal rule that the King has entrusted him with, and opens the door to the nightmare world to take a quick peek at the other side. Terrified by what he sees, he runs away but accidentally leaves the door open, allowing the evil forces to freely enter into Slumberland. They overpower King Morpheus, which is a major blow to young viewers because he's the adult authority figure who represents control and security. With the stakes raised and the fall of the Kingdom on his shoulders, Nemo must face the forces of evil to right the wrongs of his disobedience. This is a great scary movie for kids - frightening, yes, but reinforced by a strong moral core. 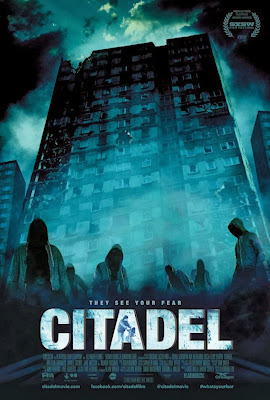 As many film folks are aware, there's been an odd international subgenre of films brewing in the last few years that feature urban "tower block" settings: District 13, La Horde, Attack The Block, The Raid, Dredd, Tower Block, The Tower, etc. For many, this Irish chiller may be one that slipped through the cracks. The story concerns a young man who is crippled by extreme agoraphobia after witnessing the murder of his pregnant wife by some juvenile thugs. His baby survives but in his paranoid state he is hardly able to properly function or take care of the child. Though he has moved away from the tower block where the incident took place, he senses that something sinister is happening there. The film works because the paranoia is steeped in gritty reality before introducing more bizarre elements. The unique setting (three massive decaying tower blocks looming over a vast wasteland spotted with a few empty rundown neighborhoods) is notable for its extreme isolation. One truly unique aspect that may help viewers appreciate the film is that the protagonist's plight was patterned after director Ciaran Foy's own struggle with agoraphobia after a terrifying experience being attacked by a gang of youths. 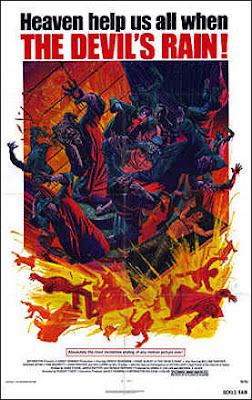 THE DEVIL'S RAIN is in my estimation the single the most undeservedly forgotten horror gem out there. It should at the very least be a popular cult classic, but instead it seems to languish in obscurity. The story deals with a Satanic cult in a desecrated church in an abandoned ghost town. Add to that a supremely interesting cast: William Shatner and Tom Skerritt share the lead with a devilish Ernest Borgnine, Ida Lupino appears in one of her final roles, and then-unknown John Travolta pops up as a blink-and-you'll miss-him baddie. The titular Devil's Rain itself is cursed rainfall which fricking MELTS PEOPLE'S FACES OFF in a stew of bubbly goop: gruesomely, nightmarishly, and even more creepy for its rough-edged 70's cinematography. But don't take my word for it; check out the gloriously nutso trailer and remember that in that era this was the sort of movie that could get a PG rating. 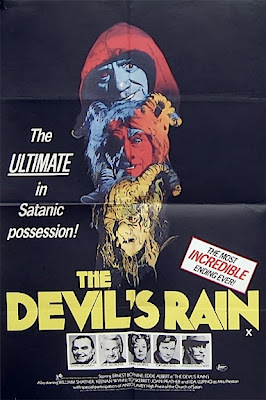 One impact that the passing of years has had on THE DEVIL'S RAIN is that the film really is whatever you want it to be. Looking for a legitimately chilling horror classic? Right here. Prefer to take it in as a Shatner novelty with Ernest Borgnine chewing the scenery as Satan? That works too. Even the gruesome violence can either be taken at face value or dismissed as special effects. Simply put, this is a superb movie that just about any cinephile could have a great time with. When I wrote this I neglected to include the fabulous zombie blaxploitation flick SUGAR HILL. Definitely one worth seeking out!